What is a Co-op Housing? The SMHC Food and Yard Waste Program will help us keep food and yard waste out of the landfill. It also complies with The City of Calgary’s Waste & Recycling Bylaw that requires onsite diversion of food and yard waste at all multi-family complexes. The food and yard waste collection areas are located in parking lots beside the garbage bins, it is your responsibility to bring your food and yard waste to the collection carts as you would with your regular garbage. There are several smaller green carts in each area that will be for organics only; the large City of Calgary bins have been switched out for large Waste Management bins. 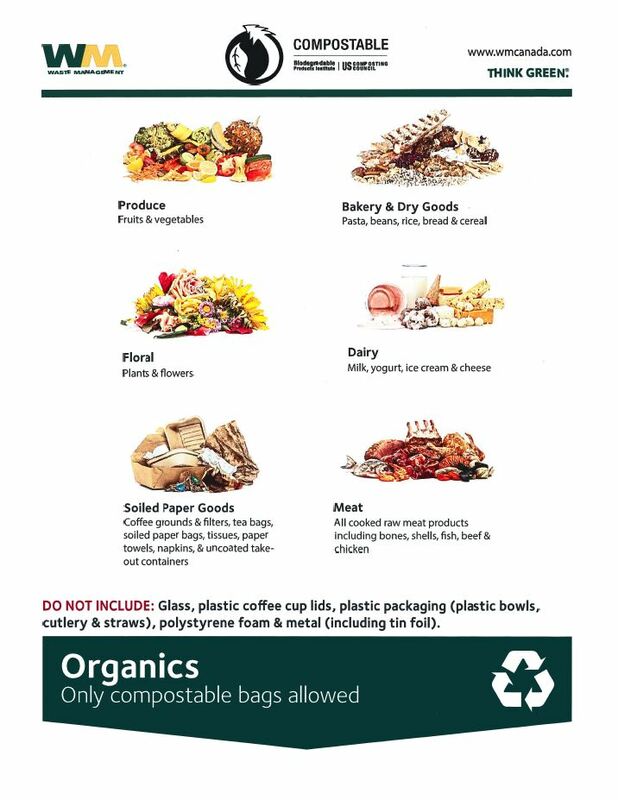 The large bins are for garbage only, which includes all items that do not go with the organics or with our regular recycling program. Our Recycling Program (paper, plastics, metals, etc.) will continue as normal. Green Dream Landscapes will be dealing with the yard waste related to their work around SMHC. How to prepare your food and yard waste. SMHC will provide the first countertop kitchen collection pail and some compost bags. This will be used to collect your food and yard waste until it is time to take it to the bins in the parking lots. Note: Future kitchen collection pails and compost bags will be Member responsibility. 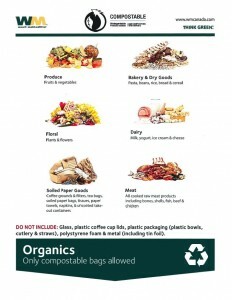 For a list of retailers that carry the compostable bags check out this page from the City of Calgary Green Cart Program website. Wash your food and yard waste storage container on a regular basis. Sprinkle a small amount of baking soda or vinegar in the bottom of your food and yard waste container. Freeze meat and fish waste until your next trip to the bin, especially during warm weather. Who collects our food and yard waste? Waste Management will collect our organic material weekly and will take it to be composted; they will also be collecting our garbage going forward. Why is it important to collect food and yard waste? Food and yard waste doesn’t turn into soil, compost or anything useful when it’s buried in the landfill because there’s no oxygen. Instead, as it slowly decomposes it releases methane, a harmful greenhouse gas, and leachate, a toxic liquid from garbage which has to be collected and treated to protect the environment. By diverting our food and yard waste, we will reduce our dependence on landfills, minimize the harmful environmental effects of food and yard waste in landfills, and produce useful new resources such as compost. While some food waste isn’t suitable for consumption – like eggshells, banana peels and bones – plenty of our food waste is perfectly edible. In Calgary it is estimated that over 50 per cent of food waste could be prevented. Consider ways to reduce food waste in your home – such as weekly menu planning, only buying what you need and storing food properly. By diverting our food and yard waste we can significantly reduce our garbage and keep this material out of the landfill. There will be more information to come, but if you have any questions, please contact the office. Please call 403-813-2783 in case of emergency. © 2015 Sarcee Meadows Housing Co-Operative. All rights reserved.